A little while ago I showed a little detail of this 'Tweet' embroidery and because Thomas posted about the pillow he made with it yesterday, I thought I would share it here as well. :) I sent it across the Big Pond, Monday a week ago and it took a little longer to arrive than I had expected but luckily just in time for Thomas to whip up a pillow and take it with him to Quilt Market in Houston, yay! Photo taken from Thomas' blog! Using the word 'Tweet' is especially appropriate because I 'met' Thomas on Twitter! 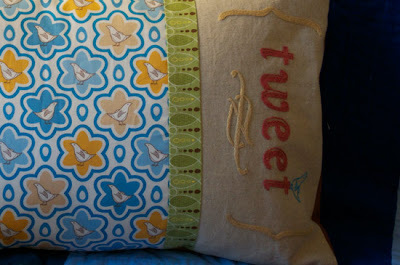 Oh and because of the birdies in the Pear Tree fabrics of course...If you want to 'Tweet' me too, you can find and follow me on Twitter! A PDF pattern (not sure if it will be an embroidery pattern or sewing/embroidery pattern) will be available soon. At least that is the plan. :) It's a fun pattern to embroider, I especially enjoyed embroidering the swirly bits and the brackets! This tweet is very sweet. I adore the brackets. Can't wait for the pdf pattern, it's on my list to make!